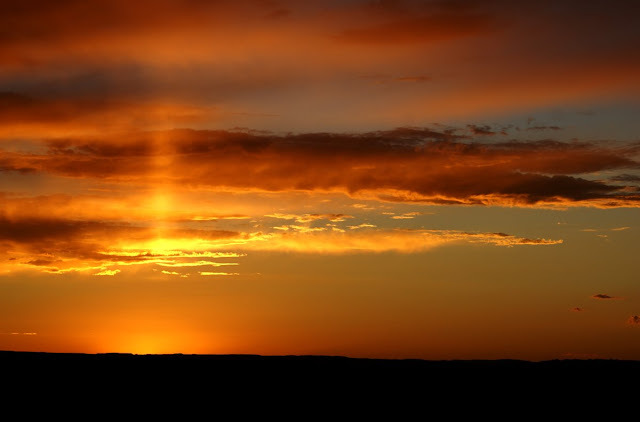 A sun pillar is a vertical shaft of light that can extend upwards from the sun or downwards, usually seen at sunset or sunrise. Sun pillars form when sunlight reflects off the surfaces of falling ice crystals associated with thin, high-level clouds (like cirrostratus clouds). The hexagonal plate-like ice crystals fall with a horizontal orientation, gently rocking from side to side as they fall. When the sun is low on the horizon, an area of brightness appears in the sky above (or below) the sun as sunlight is reflected off the surfaces of these tipped ice crystals. Thank you, University of Illinois! Purnima, I am still trying to untwist my tongue. Monoclonal antibody?! Yikes. Kya tum microbiologist ho? By Moab, I mean the mecca of outdoor activity in Utah. Here's a brief photo essay on Moab and nearby attractions. Oh..okay! Tks for such a prompt reply! C how powerful that small post from you was!! BTW even Moab was a new word for me, googled n got that! MICROBIOLOGIST?? !! U hold all the possible info stumping me every single time, hv to increase my memory power to remember what u teach ..Lady Dronacharya! She keeps them short and calls them "more than a recipe'... and that is *not* enough for us, I say! Nirmala, you are so sweet, unlike the two who arrived after Sunita. Not only am I incredibly busy this week, I have work going on in the house and I am helping out at the Book Fair at Medha's school. Add Parent Teacher conferences to the mix for today. Not to mention the cold, made even more intense by lack of doors during the day. Brrr! I wish I had time to write words but you know what they say: a picture paints a thousand words! Sunita, thanks! It was a gorgeous sight! It was the first sun pillar I have ever seen. I had only heard of them before. Priyanka, thank you! I took this on my first visit to Arches National Park near Moab, Utah. It set the mood for the rest of the trip. Absolutely gorgeous!! I hope one day I can see this for real! That is beautiful and thanks for the education. Mine too, Priya. I noted.